Rarely does a sequel surprise you. Most are just uncreative Hollywood retreads intended to be cash cows for the studios, but there have been a few jewels of equal of surpassing value, the greatest of them being The Empire Strikes Back, with Indiana Jones and The Last Crusade, Terminator 2, and Star Trek: The Wrath of Khan are worthy successors as well. 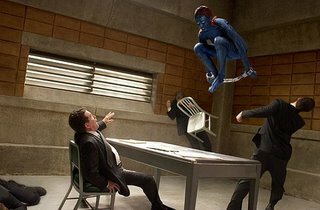 X-Men III: The Last Stand now joins these celebrated sequels. Director Brett Ratnor, of the Rush Hourfranchise, cobbles together a darkly beautiful morality play that asks the question: If a cure fundamentally changes the person, is it really a cure? and should it be compelled? When a strange mutant child (strange for a mutant that it) whose power cancel that of other mutants, a pharmaceutical company, led by the father of a mutant, develops an injection that masks the mutant X gene. The cure is weaponized by the government, and lines a drawn once again between Magneto and Charles Xavier. As a subplot, the Dark Phoenix saga plays out with the return of Jean Grey and the deaths of several major characters. Of course, the strength of the cast drives this movie. Ian McKellan, Patrick Stewart, Halle Berry, Hugh Jackman Kelsey Grammar, Rebecca Romijin, and Anna Paquin all deliver regardless of whether their skin painted or their hair is dyed. Eliciting their best performance cannot be that hard, but because of the cast, a poignant story is told within the confines of the action. It is now official: Summer has begun, and we know this because the first grat summer blockbuster has finally arrived.